Fresh but hearty, great for a chilly spring night. In a large saucepan, heat 2 tablespoons of olive oil. Add the peppers, onion, yellow squash, zucchini, mushrooms, and half of the garlic. Sauté for 1 minute. Deglaze the pan with Pinot Noir. Simmer 1 minute. Add 1 3/4 cups of water, canned tomatoes, Italian seasoning, 1 teaspoon salt, 1/2 teaspoon pepper, bay leaf and the tomato paste, bring to a boil. Lower the heat and simmer for 20-25 minutes or until the vegetables are soft. Meanwhile, combine diced potatoes, 1 tablespoon olive oil, 1/4 teaspoon salt, 1/4 teaspoon pepper, lemon juice and remaining garlic in a bowl. Toss to coat, and then bake for 15 minutes. 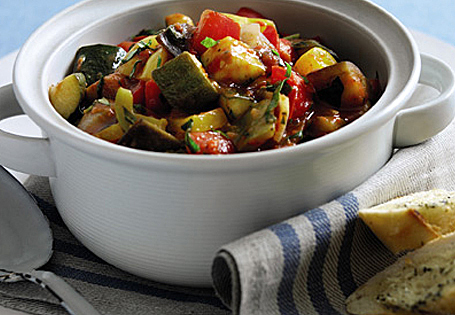 When vegetables are finished stewing, add fresh tomatoes, cooked potatoes and fresh basil to pan. Serve with garlic Texas toast, cooked to package directions.